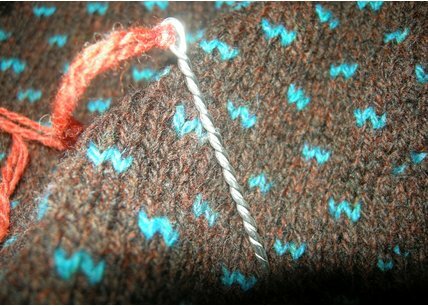 One of the things I wasn't going to buy at TKGA was this sterling silver tapestry needle. It comes from Crown Mountain Farms of Yelm, WA. Yelm, WA is one of those wide spots on I-5 between Portland and Seattle that I thought didn't have anything I needed. Boy have I been wrong. Once I saw that Carson had one of these, I lost all my resolute determination and just about knocked down the cash register in the rush to get my own. I'm so glad I lost my resolve and buckled under the weight of Knitting Tool Lust. Using this needle is like putting on your great-grandmother's string of pearls in anticipation of the party of the year. It's heavy, smooth, and trusty. Not to mention easy to thread. If you are looking for a special gift for yourself or anyone else you love, this is the ticket. It's the needle equivalent of continental-size sterling hotel flatware. Do not delay; succumb to the Lust. In other news, my limited math skills have alerted me that I have four (4) weeks till deadline for all my patterns and samples. This is the same thing emotionally as falling off a high ledge is physically: Not really enough time to change anything; only enough to realize what's about to happen. It leads me to reflect on the nature of needles and haystacks, and things that are either lost, or thought to be. I seem to have misplaced my self-assurance. It isn't that I can't give up sleeping, (I've already done away with housework, social interaction and basic hygiene), or that I don't know how to pace myself. It's more a matter of cumulative fatigue. I have been on this completely unrealistic production schedule for so long that I have no memory of what I used to do with my time before there was a book to write. I think there may have been something to do with children, but memory simply fails. However, it seems to me that the more beautiful the needle, the more worthwhile it is to dive into the haystack. I just have to remember how much I like my designs, and how much I want to share them. Where theres' a will, there's a way, no?